Pitfalls Encountered in the Analysis of Biomedical Specimens: Beware of Dangerous Traps. Henry H. Mantsch Institute for Biodiagnostics, Winnipeg, Canada. This presentation will address a number of problems commonly encountered with the analysis of biomedical samples, both from a spectrocopic and from a data handling point of view. Considerations Involved in the Development of an FTIR Analyzer for Differentiation of Cell Populations Ashraf A. Ismail, Janie Dubois, and Margarita P.Quinteiro Rodríguez McGill IR Group, Macdonald Campus of McGill University, 21,111 Lakeshore Road, Ste. Anne de Bellevue, Québec H9X 3V9, Canada. FTIR spectroscopy has been employed for the past three decades as a research tool in the study of the structure of biomolecules. The 1990s have seen a tremendous growth in research whose aim is to apply the body of knowledge accumulated over the past three decades to the development of bio-analytical methods and devices and diagnostic tools for the healthcare sector. The successful implementation of FTIR spectroscopic techniques in this area requires the contribution of expertise from spectroscopists, biochemists, physicians, biomedical and optical engineers, programmers, and statisticians. This presentation will focus on some of the spectroscopic issues that have to be addressed in the application of FTIR spectroscopy for the differentiation of cell populations, based on our experience in the development of an FTIR analyzer for bacteria identification and the examination of the FTIR spectra of cervical smears. Aspects to be considered in the development of FTIR analyzers for these types of applications include optical layout, resolution, signal-to-noise, and purge requirements, spectral reproducibility, and frequency and intensity validation. The choice of sampling accessory is also of immense importance, since the simplicity of operation and the extent of automation can determine acceptance or rejection of the technology by the end user. Other factors to be considered are the choice of IR substrate, since the cost of some of the materials normally employed for acquiring infrared spectra can be prohibitive if sample archiving is required, as, for example, in the screening of cervical smears, where samples must be kept for a minimum of five years, and samples containing abnormal cells must be kept indefinitely. Another consideration in relation to archiving is the selection of a suitable fixative agent and evaluation of its effect on the IR spectrum of the sample. Finally, the robustness of the data analysis algorithms employed must be thoroughly examined, as small changes in the spectrum (from sample to sample of the same cell population or from instrument to instrument) can exceed the subtle spectral differences that allow cell populations to be differentiated. We will describe how these various considerations were addressed in the assembly of a dedicated FTIR analyzer for the differentiation of cell populations. The Rapid Characterisation of Microbial Pathogens using Hyperspectral, Whole-Organism Fingerprinting and Chemometrics. Royston Goodacre*1, Éadaoin M. Timmins1, Richard J. Gilbert1, Janet Taylor1, Paul J. Rooney2 and Douglas B. Kell1 1Institute of Biological Sciences, University of Wales, Aberystwyth, Ceredigion, SY23 3DD, Wales 2Bronglais General Hospital, Aberystwyth, Ceredigion, SY23 1ER, Wales. *Telephone: +44 (0)1970 621947; Telefax: +44 (0)1970 622354; E-mail: rrg@aber.ac.uk. Ideal techniques for the rapid characterisation of microbial pathogens would include those which require minimal sample preparation, permit the automatic analysis of many serial samples with negligible reagent costs, allow their rapid characterisation against a stable database, would be easy to use and would be operated under the control of a PC. With recent developments in analytical instrumentation, these requirements are increasingly being fulfilled by pyrolysis mass spectrometry (PyMS) and the vibrational spectroscopic methods of Fourier transform-infrared spectroscopy (FT-IR) and dispersive Raman microscopy. We have shown that these techniques, but only when combined with chemometric methods, provide very rapid, accurate and generic approaches to the characterisation of micro-organisms. Examples will be given where we have shown that it is possible to (1) discriminate between common infectious agents associated with urinary tract infection , (2) assess the resistance or otherwise of Staphylococcus aureus to the antibiotic methicillin [2, 3]. Chemometric prossessing has classically been done with partial least squares and artificial neural networks, but the information in terms of which parts of the spectra are important is not readily available, which is (i) why these methods are perceived as a �black box� approaches to modelling spectra, and (ii) indeed why these 'data crunching' techniques are often out of favour with many spectroscopists. Genetic programming (GP) is an evolutionary technique which uses the concepts of Darwinian selection to generate and optimize a desired computational function or mathematical expression [4, 5]. Examples of our recent developments in GP will be demonstrated; (1) for the identification from their PyMS spectra, of a group of bacteria which have been implicated in periodontitis, endodontic infections and dentoalveolar abscesses , and (2) for the detection of the dipicolinic acid biomarker in the FT-IR spectra of Bacillus spores . Goodacre, R., Timmins, É. M., Burton, R., Kaderbhai, N., Woodward, A., Kell, D. B. and Rooney, P. J. (1998). Rapid identification of urinary tract infection bacteria using hyperspectral, whole organism fingerprinting and artificial neural networks. Microbiology 144, 1157-1170. Goodacre, R., Rooney, P. J. and Kell, D. B. (1998). Rapid analysis of microbial systems using vibrational spectroscopy and supervised learning methods: application to the discrimination between methicillin-resistant and methicillin-susceptible Staphylococcus aureus. SPIE 3257, 220-229. Goodacre, R., Rooney, P. J. and Kell, D. B. (1998). Discrimination between methicillin-resistant and methicillin-susceptible Staphylococcus aureus using pyrolysis mass spectrometry and artificial neural networks. Journal of Antimicrobial Chemotherapy 41, 27-34. Koza, J. R. (1992). Genetic Programming: On the Programming of computers by Means of Natural Selection. Cambridge, MA: MIT Press. Gilbert, R. J., Goodacre, R., Woodward, A. M. and Kell, D. B. (1997). Genetic programming : a novel method for the quantitative analysis of pyrolysis mass spectral data. Analytical Chemistry 69, 4381-4389. Taylor, J., Goodacre, R., Wade, W. G., Rowland, J. J. and Kell, D. B. (1998). The deconvolution of pyrolysis mass spectra using genetic programming: application to the identification of some Eubacterium species. FEMS Microbiology Letters 160, 237-246. Goodacre, R., Shann, B., Gilbert, R. J., Timmins, É. M., McGovern, A. C., Alsberg, B. K., Logan, N. A. and Kell, D. B. (1998). The characterisation of Bacillus species from PyMS and FT IR data. In Proc. 1997 ERDEC Scientific Conference on Chemical and Biological Defense Research. Aberdeen Proving Ground. Identification of Dermatophytes by Fourier Transform Infrared Spectroscopy J. Bastert1, H.C. Korting1, P. Traenkle2, A.F. Schmalreck2 1Dermatologische Klinik und Poliklinik der Ludwig-Maximilians-Universität München, Frauenlobstr. 9-11, 80337 München, Germany 2Pfizer/Mack Microbiology Laboratories R&D, 89257 Illertissen, Germany. Fourier transform infrared spectroscopy (FTIR-S) is an established method for the routine diagnosis of various microorganisms such as yeasts and bacteria on a species level. The cell at large and also its components like nucleic acids, proteins, fatty acids, lipids and polysaccharides can be analysed by FT-IR spectroscopy. Currently, the differentiation of filamentous fungi in the routine laboratory is based on microscopy of the native material addressing morphology and biochemistry of cultures, and to a lesser extent molecular biology. The possible value of FTIR-S in the diagnostics of dermatophytes was analyzed using three clinical isolates each of the three species most frequently found in Central Europe, i.e. Trichophyton rubrum, Trichophyton mentagrophytes and Microsporum canis. The samples were analyzed using a special FT-IR spectrometer (Bruker IFS 28/B, Bruker Analytik, Karlsruhe, Germany). 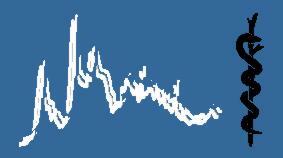 The spectra thus obtained were further analyzed by means of the OPUSâ software (Bruker Analytik). The setting of the spectral windows that were used for analysis were determined empirically and reflected the arrangement for the spectral analysis of yeasts. The preliminary data obtained suggest that FTIR-S diagnostics of dermatophytes on species level is possible. To allow a reliable identification of all clinically important dermatophyte species a spectral library must be established. To that end many specified reference strains and a significant number of clinical isolates identified by routine methods are required as well as reproducible standards concerning culture and preparation conditions. This might help to make repeated sub-cultures redundant, which are money- and time-consuming. Microbial Characterization by Raman Spectroscopy L.P. Choo-Smith1, K. Maquelin1, T. Bakker Schut1, H. Ph. Endtz2, H.A. Bruining3, G.J. Puppels1,3 1Laboratory for Intensive Care Research and Optical Spectroscopy, Erasmus Univerisity Rotterdam; 2Dept. Medical Microbiology and Infectious Disease, University Hospital Rotterdam "Dijkzigt"; 3Dept. General Surgery, University Hospital Rotterdam "Dijkzigt", Surgery 10M, Dr. Molewaterplein 40, 3015 GD Rotterdam, The Netherlands. The increasing rise in drug resistant strains of microorganism has prompted the search for new rapid techniques for the identification and drug susceptibility testing of microorganisms. One of the methods under investigation is the use of confocal Raman microspectroscopy. With this approach, Raman spectra of good signal-to-noise ratios can be obtained within a few minutes from a small sampling volume. This offers the advantage of small sample requirements and from a clinical microbiological viewpoint, shorter culturing times thus allowing rapid identification and characterization. Two main methods can be employed for the Raman investigation of microorganisms. Firstly, Raman spectra can be acquired from microorganism initially cultured for approximately 16 hours on solid culture medium, followed by the selection of groups of cells from visible colonies for the transfer onto a substrate for spectral acquisition. Alternatively, using confocal Raman microspectroscopy, spectra can be acquired directly from microcolonies (~ 6 hours growth time) still growing on solid culture medium. This method eliminates the need to transfer cells onto substrates since the petri dish containing the cultured microorganisms can simply be placed under a microscope objective for selection of microcolonies (30-40 µm diameter) for spectral measurement. Furthermore, with the cells still in contact with the culture medium, they are kept viable thus providing a spectroscopic signature of the cells "in-situ" (i.e. growing on the culture medium). However, with the latter approach, one complicating factor is the presence of the underlying culture medium in the measured spectrum especially when the layer of cells is smaller than the total measuring volume obtained with the confocal setup. Various methods were investigated for the subtraction of the medium signal from the spectra of cells (see poster of Maquelin et al.). Using the above approach, Raman spectra were acquired from Enterococcus faecium (E. faecium) strains resistant or sensitive to the antibiotic vancomycin. Enterococcus is the second to third most commonly isolated organisms from nosocomial infections.1 The resistance of vancomycin is a growing concern in the clinical setting as the resistance gene can be transferred to other gram-positive organisms for which vancomycin is often the considered the primary therapeutic alternative. This transfer could potentially result in the presence of an untreatable microbe.1 The Raman spectra of vancomycin resistant or sensitive E. faecium microcolonies very closely resemble one another. However, the difference spectra reveal variation in spectral features which can be assigned to biochemical differences possibly arising from the drug susceptibility difference. Using principal component analysis followed by cluster analysis, it was not possible to clearly distinguish two clusters of vancomycin sensitive or resistant strains. However, employing supervised classification approaches such as linear discriminant analysis or region selection genetic algorithms, spectra of sensitive and resistant microcolonies could be separated with 85-95% accuracy. Further improvement of the classification may be achieved by growing the microorganisms in sub-minimal inhibitory concentrations of vancomycin in order to stimulate the expression of the resistance phenotype. 1 Murray, B.E. "Vancomycin-resistant Enterocci" Am. J. Med. 102: 284-293, 1997. Fourier Transform Infrared Spectroscopy (FT-IR) - A New Tool for Typing Cryptococcus neoformans and Identifying Candida Species Kathrin Tintelnot, Berit Müller, Michael Seibold, Gerhard Haase, Maren Stämmler, Tatjana Franz, Dieter Naumann. Robert Koch-Institut, Berlin, Germany. Changes in the aetiology and clinical spectrum of cryptococcoses in Europe make identification of Cryptococcus neoformans isolates under the species level important. Different methods for typing are applied, like electrophoretic karyotyping, DNA-fingerprinting, RAPD-PCR or sensitivity testing against killer toxin [1,2]. Worldwide serotyping is an established method to differentiate individual strains in five known serotypes A, D, AD (Cryptococcus neoformans var. neoformans) and B, C (Cryptococcus neoformans var. gattii) . Cryptococcus neoformans strains from different patients and countries were analysed using Fourier Transform - Infrared spectroscopy (FT-IR). Data were compared with the results of D-proline assimilation test for classification into the two varieties and serotyping, performed with factor specific antisera (Crypto Checkâ , Iatron Laboratories Inc. Tokyo /Japan). FT-IR spectroscopy showed a high reproducibility. The spectral range between 800 - 1400 cm-1 turned out to be characteristic of the polysaccharide structure and composition of the capsule of Cryptococcus neoformans. It could be shown that with one frequency range (1140 - 1200 cm-1) Cryptococcus neoformans var. neoformans and Cryptococcus neoformans var. gattii strains can clearly be separated in two distinct clusters. Within the two variations it was furthermore possible to discriminate between the serotypes A and D and between B and C, respectively. Cluster analysis of follow up isolates from different patients demonstrate, that FT-IR is a fingerprinting like method of high discriminative power. FT-IR spectroscopy is also a reliable method for identification of different Candida species [4, 5]. The importance of this method could be demonstrated by pheno- and genotypically closely related Candida species, especially Candida albicans and Candida dubliniensis . Candida isolates, biochemically and morphologically highly suspicious to be Candida dubliniensis were investigated by FT-IR spectroscopy and by sequencing of the ITS1 region: Both methods resulted in identical separate clusters for these two Candida species. References: 1. Boekhout, T., A.v.Belkum, A.C.A.P. Leenders et al. (1997) Molecular typing of Cryptococcus neoformans: taxonomic and epidemiological aspects. Int. J. Syst. Bacteriol. 47: 432-442. 2. Viviani, M.A., H. Wen, A. Roverselli, R. Caldarelli-Stefano, M. Cogliati, P. Ferrane, A.M. Tortorano (1997) Identification by polymerase chain reaction fingerprinting of Cryptococcus neoformans serotype AD. J. Med. & Vet. Mycol. 35: 355-360. 3. Ikeda, R., T. Shinoda, Y. Fukazawa, L. Kaufman (1982) Antigenic characterization of Cryptococcus neoformans serotypes and its application to serotyping of clinical isolates. J Clin. Microbiol. 16: 22-29. 4. Schmalreck, A.F., P. Tränkle, E. Vanca R. Blaschke-Hellmessen (1998) Differentiation and charakterization of Candida albicans, Exophiala dermatitidis) and Prototheca spp. by Fourier-transform infrared spectroscopy (FT-IR) in comparison with conventional methods. mycoses 41 (suppl.) 71-77. 5. Timmins, E.M., S.A. Howell, B.K. Alsberg, W.C. Noble, R. Goodacre (1998) Rapid differentiation of closely related Candida species and strains by Pyrolysis-Mass Spectrometry and Fourier Transform-Infrared Spectroscopy. J. Clin. Microbiol. 36: 367-374. 6. Sullivan, D.J., T.J. Westerneng, K.A. Haynes, D. E. Bennett, D.C. Coleman (1995) Candida dubliniensis sp. nov.: phenotypic and molecular characterization of a novel species associated with oral candidosis in HIV-infected individuals. Microbiol. 141: 1507-1521. Identification of Clostridium Species by the Fourier Transform Infrared Spectroscopy B. Herding-Sotzeck, G. Schallehn Institut für Medizinische Mikrobiologie und Immunologie der Rheinischen Friedrich - Wilhelms - Universität zu Bonn, Germany. The applicability of the Fourier transform infrared spectroscopy for the identification of clostridia was tested. An IFS 25/B-FT-IR-spectrometer supplied with an OPUS software (produced by Bruker, Karlsruhe, Germany) was employed. A ZnSe optical plate and a KBr disk were used as a measuring cell, measuring 15 samples against a background. The preparation and measurement (spectral range: 4000 cm-1 to 500 cm-1) of these 15 samples could be completed in about 90 minutes. Columbia-agar plates containing 5% sheep-blood (Oxoid) were employed as the standard medium for culture. The preparation was carried out according to the given standard conditions. In tests deviated from the standard preparation it was shown that differences in the intensity of the CH2-signals may not only be due to traces of paraffin derived from the initial culture but also due to old cell material. This disturbance could be avoided by strictly following the standard conditions. Differences, which arose from growth variations such as those due to different states of sporulation or those due to different amounts of storage material (e.g. poly-ß-hydroxybutyric acid) as represented in C. sordellii and C. tetanomorphum strains, were also discussed. The main task of the work was to produce a reference library of spectra for the identification of members of the genus Clostridium. Various libraries were arranged with 28 Clostridium-species (242 strains) differing either in the spectral ranges and their weighting or in the use of 268 average spectra or 794 single spectra respectively. The reliability of the data was confirmed by examining 1892 measurements. 93% to 97% of the spectra could be identified correctly, which is to be considered excellent. The test results showed that the single spectra library in combination with the standard spectral ranges and their weighting should be prefered to others. In addition to that, the suitability of another "validated library" was screened by means of 145 test spectra. The validation of the libraries by strain specific limiting values and the corresponding application of average spectra in the recommended form has shown to be unfavourable. Identification of the spectra based on this validated library often was incorrect. In conclusion it can be stated that the FT-IR-spectroscopy for the identification of clostridia has proved to be energy- and timesaving in comparison to the conventional biochemical methods. Spectral Data Processing and Spectral Pattern Recognition: New Techniques Applied to FT-IR and FT-Raman Spectra in Biomedical Applications J. Schmitt*, T. Udelhoven**, H.-C. Flemming* * Dept. Aquatic Microbiology, Spectroscopy Group, University of Duisburg, Moritzstr.26, 187546 Mülheim, Germany. ** University of Trier, FB VI, Tarforster Höhe, 50289 Trier, Germany. Biological and biomedical applications of vibrational spectroscopy have witnessed an enormous progress in the past. FT-IR and FT-Raman spectroscopy are used to characterize and differentiate microorganisms, test the susceptibilty of pharmaceuticals to bacteria and are used to investigate mamalian cells, tissues, body fluids and for infrared imaging. To cross the margin and transfer these elaborated spectroscopic techniques into routine analysis and applications, high requirements in the reliability and simplicity of use are given. The common spectral feature of all complex biological materials is their small spectral variance between the different objects. Therefore, new strategies for data evaluation are required. Methods of pattern recognition like artificial neural networks with appropriate techniques of spectral feature selection and data preprocessing are promising techniques. One of the most important preprocessing steps when conceiving a classifier system is the spectral feature selection, motivated by the improvement of the quality of the classifier system, where less complexity and lower error rates can be expected. Several methods have been tested in respect of their practical value for building spectral libraries for bacterial identification and biomedical applications. These methods include the different statistical algorithms to calculate the inter-, intra- and probabilistic distances. To avoid the brute force calculation of this readily expanding matrix calculation, combinations with optimization strategies like Genetic Algorithms (GA) have been performed and will be presented. With this evolutionary technique, it is generally expected that the computational progress is enhanced, reducing the calculation time and optimizing the selection of the wavelengths with the highest discrimination power. For spectral identification, different types of artificial neural network architectures have been applied. The requirements to succesfully develop neural networks are outlined and the advantages and disadvantages of these systems in respect of different classification problems during the developement of large spectral libraries will be discussed. Our goal was to develop neural libraries for bacterial identification with large numbers of classes. With the developement of such integrated data elucidation systems, the combination of vibrational spectroscopy with stacked spectra preprocessing, feature selection and artificial neural networks seems to open the perspective of a methodology that can be used as an effective tool in diagnosis and therapy . Human Oral Mucosa Studies under Varying Blood Glucose Concentrations by Mid-infrared Spectroscopy using the Attenuated Total Reflection Technique. H.M. Heise and R. Marbach* Institut für Spektrochemie und Angewandte Spektroskopie Bunsen-Kirchhoff-Str. 11, 44139 Dortmund, Germany. * present address: 161 View's Street, Indiana, PA 15701, U.S.A.
Biosamples have often been quantitatively characterized in the clinical laboratory using infrared spectroscopy. Another domain are non-invasive measurements suitable for in-vivo monitoring of skin. Oral mucosa has been suggested as an especially suited subject for drug delivery and in-vivo monitoring of endogenous body metabolites due to histological and physico-chemical properties. The attenuated total reflection technique (ATR) was used to characterize the outermost epidermal layer of human oral mucosa by means of Fourier-Transform infrared spectroscopy. The penetration depth of the probing radiation in the mid-infrared fingerprint region, using a ZnSe-crystal for the horizontal ATR accessory, is in the order of a few micrometers so that microlayer information can be obtained by such a technique. Spectra of outer human lip and saliva components are presented for comparison. Lip spectra of several test persons were consecutively recorded during oral glucose tolerance tests. The varying blood glucose concentration was followed by means of frequent blood testing. Variability of the outmost microlayer has been studied using factor analysis of the ATR inner-lip spectra. There is no clear evidence that the blood glucose concentration can be followed by mid-infrared spectroscopy of inner lip tissue as claimed by other scientists. Non-invasive spectroscopic methods exploiting trace signals require special attention paid to the variability due to person-to-person differences and changes in physiological conditions. The IFS 28/B: New Applications in Microbiology Frank Mertens Bruker Optik GmbH; Wikingerstr. 13, 76189 Karlsruhe, Germany. Tel. : +49-(0)721/9528-721; Fax: -712; E-mail:Frank.Mertens@bruker.de. During the past few years FTIR spectroscopy has grown to a very powerful and flexible technique for the differentiation and identification of microorganisms. For a successful use in microbiology, however, certain rules for standardization must be observed. Only then the creation of stable reference data sets that can be used over many years and by different users, becomes feasible. The overall composition of the cell is quite similar for all groups of micro-organisms. This is reflected by the high degree of similarity of the IR spectra from different micro-organisms. In order to use these small spectral differences for systematic purposes, the compliance with certain basic rules is crucial. One important factor is the spectrometer. The Bruker IFS 28/B is the only dedicated FTIR spectrometer for microbiological diagnosis. The high quality of its optical design and the stability of the instrument guarantee a high degree of reproducibility and thus make it possible to transfer data between different instruments of the same type. The other important factor for good results is the standardization of the cultivation and the preparation of the samples. The influences of the growth medium and other parameters on the quality of the IR spectra and on the subsequent evaluation of the data are discussed. A very demanding application in terms of a standardized procedure is the analysis of closely related strains of micro-organisms of the same species. As an example, the differentiation of probiotic strains of Bacillus cereus from other strains of this species is presented . Reproducibility of the spectra is especially important for the creation of reference libraries that can be applied by different users. A new Bruker reference library for the analysis of bacteria from drinking water is presented, which allows an identification of isolates from drinking water. For the analysis of "difficult" groups of microorganisms it may be necessary to develop new procedures for cultivation, sample preparation and measurement, that take into account special features of the respective organisms. In this context, the specific requirements for the analysis of yeasts and actinomycetes are discussed [2 - 4]. Haag, H., H.-U. Gremlich, R. Bergmann, J.-J. Sanglier (1996) Characterization and identification of actinomycetes by FT-IR spectroscopy. J. Microbiol. Meth. 27:157pp. Kümmerle, M., S. Scherer, H. Seiler (1998) Rapid and reliable identification of food-borne yeasts by Fourier-transform infrared spectroscopy. Appl. Environ. Mirobiol. 64:2207pp. Schmalreck, A., P. Tränkle, E. Vanca, R. Blaschke-Hellmessen (1998) Differenzierung und Charakterisierung von humanpathogenen Hefen (Candida albicans, Exophiala dermatitidis) und tierpathogenen Algen (Prototheca spp.) mittels Fourier-Transform-Infrarot-Spektroskopie (FT-IR) im Vergelich zu konventionellen Methoden. Mycoses 41 (Suppl. 1):71pp. A variety of infrared spectroscopic techniques have been applied to many, very different types of biomedical subjects, ranging from different body fluids to tissue sections of various organs, but what is, or will be, the leading practice for medical diagnosis and prognosis? Since infrared spectra mostly reflect the sum of the biochemical components present in the biological object analyzed, minor changes in these spectra indicate major changes within cells, tissues or biofluids which are produced and excreted by cells. The detection of these changes combined with the clinical diagnosis then provides the opportunity of calibrating the differences observed and applying the information to undetermined samples. The weakest part of this approach is the reliability of the clinical diagnosis which (if for example only 80 % correct) may not be very helpful for the calibration. In addition, the spectroscopic description of normal reference samples is quite difficult, since it can only be made on samples from volunteers, who will usually not offer donations of problematic fluids and tissues e.g. from liver or brain. An example of a method of circumventing many of these difficulties of spectral calibration is the clinical use of multiple sample resources in thyroid cancer. Fine-needle aspirates (FNAs), larger needle biopsies and excised tissues after gland removal establish and verify the diagnosis after surgery. This allows the calibration of biofluid spectra based on the final diagnosis. 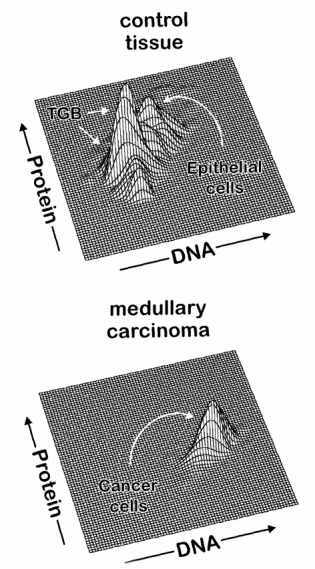 Furthermore, spectroscopic analysis of the excised tissues provides an excellent reference for normal, benign and malignant cells and cell aggregates which are normally present in aspirates and of diagnostic value for cytology. After this evaluation procedure, the (now improved) calibration of the FNA spectra provides sufficient information to allow the differentiation of benign from malignant tumors even under circumstances when cells for cytological diagnosis could not be obtained by aspiration. The standard tools for the infrared analysis performed are the comparison of relative band intensities, correlated intensities of two bands (bivariate statistics) and pattern recognition techniques. Nosocomial infections are hospital-acquired infections that are seldom due to pathogenic "opportunist" bacteria. These microorganisms are weakly virulent, come from the environment and are often not susceptible to antibiotics. Examples that will be considered are Pseudomonas aeruginosa and Escherichia coli. P. aeruginosa, which is naturally susceptible to imipenem (a carbapenem antibiotic that belongs to the group of thienamycins), can however become resistant due to high antibiotic concentrations. Strains that are specifically resistant to imipenem and do not show any cross resistance to other b -lactams or other antibiotics have emerged during therapy for infections of P. aeruginosa and from spontaneous infections in-vitro. For E. coli, a majority of strains are susceptible to many b -lactams but however, clinical isolates can be resistant to b -lactams by high level production of a chromosomally coded cephalosporinase or by production of plasmid-mediated b -lactamases. Here, the resistance mechanism is an acquired one, different from that encountered in the case of P. aeruginosa above. Among the existing means to follow drug-target interaction, FT-IR spectroscopy has proved to be well adapted due to its "fingerprinting" capabilities. The use of distinct frequency domains for the discrimination of bacteria is now well established (Naumann, 1991). Spectra are abundant in molecular-level information, not always perceptible, but can be revealed by using judicious mathematical or statistical methods (Naumann et al, 1991: Goodacre et al, 1996: Sockalingum et al, 1997: Bouhedja et al, 1997). Both principal component analysis and hierarchical clustering have been applied to FT-IR spectra recorded on clinical strains of P. aeruginosa and E. coli. Classifications based on the normalized spectra as well as on their derivative spectra appear to give satisfactory results. However, it should be noted that, unlike principal component analysis, tree diagrams purely provide only a taxonomy of objects in the analysis; no inferences regarding latent (underlying) variables that correlate with observed measures are implied by this method . On the other hand, when cluster analysis does not give a satisfactory classification of elements, one can perform a principal component analysis before the cluster analysis, which may sometimes give a better grouping of these elements. However, whichever classification method is used, there is always some loss of information. Bibliography Bouhedja, W., Sockalingum, G.D., Pina, P., Allouch, P., Bloy, C., Labia, R., Millot, J. M. and Manfait, M. FEBS Letters,1997, 412: 39-42. Goodacre, R., Timmins, E. M., Rooney, P. J., Rowland, J. J. and Kell, D. B. FEMS Microbiology Letters, 1996, 140: 233-239. Naumann, D., Helm, D. and Labischinski, H. Nature, 1991, 351: 81-82. Naumann, D., Helm, D., Labischinski, H. and Giesbrecht, P. In: Modern Techniques for Rapid Microbiological Analysis, Nelson, W. H. (ed. ), VCH Publishers, Inc., 1991, pp. 43-95. Sockalingum, G.D., Bouhedja, W., Pina, P., Allouch, P., Mandray, C., Labia, R., Millot, J. M. and Manfait, M. Biochem. Biophys. Res. Comm.,1997, 232: 240-246. FT-IR Spectroscopic Investigations of Protein-Drug Interactions in a Stopped-Flow System D. A. Moss Karlsruhe Research Center, Institute for Instrumental Analysis, P.O. Box 3640, 76021 Karlsruhe, Germany. FTIR spectroscopy of proteins has the unusual disadvantage of providing too much information. Thousands of individual bands contribute to the spectrum, leading to an overlap so extensive that essentially all detail is obscured. Difference spectroscopy and kinetic spectroscopy are well established approaches to the extraction of useful data from this surfeit of information (Siebert, 1995). These approaches circumvent the problem of band overlap by recording only the changes in the FTIR spectra of proteins that accompany their reactions. With careful experimental design, such methods permit the precise characterization of extremely small relative changes in infrared absorbance, while the absorbance due to the unreacting bulk of the protein is eliminated by subtraction. The data obtained reflect the structural changes in the protein that accompany its catalytic cycle, and are of direct relevance to studies of molecular mechanisms and structure/function relationships. In addition, there are wide-ranging possibilities for biomedical applications of the technique as an extremely fast and convenient method for identifying proteins and verifying their structural and functional integrity. To date, reaction-induced FTIR difference spectroscopy has mainly been used for fundamental investigations of photobiological systems, light-minus-dark spectroscopy being a particularly convenient perturbation method for triggering reactions in situ in the FTIR spectrophotometer without otherwise disturbing the sample. Electrochemical methods have also been employed for reduced-minus-oxidized spectroscopy of redox proteins and enzymes (Moss et al., 1990); this significantly extends the range of proteins to which the technique can be applied, but is still far from universal. Our current work on rapid-mixing methods for FTIR difference spectroscopy is intended to realize the potential of the technique as a generally applicable tool for the investigation and characterization of proteins and their reactions. The present work describes our application of this approach to the characterization of protein-drug interactions as a research tool for the pharmaceutical industry. Data will be presented to illustrate the validation of the technique using the protonation and redox reactions of cytochrome c as a model, and on the monitoring of autolysis reactions and inhibitor binding in proteases. The potential for further biomedical and clinical diagnostic applications will be discussed. Interpretation of Infrared Spectra of Single Cells and Tissue Max Diem Department of Chemistry and Biochemistry, City University of New York, Hunter College, 695 Park Avenue, New York, NY 10021, USA. Over the past decade, several research groups have used infrared spectroscopy to distinguish healthy and diseased cells and tissues. Some of the earlier attempts led to severe misinterpretations of the spectral results due to an insufficient understanding of the spectral features of cellular components, and an equally severe neglect of incorporating well-known pathological facts into the infrared spectral correlations. In this lecture, spectral features of the major cellular components (proteins, nucleic acids, phospholipids and others) will be discussed in light of the degree of hydration and sample treatment. Subsequently, an analysis of cells and tissues from the liver, squamous epithelium and blood in terms of the variations of cellular components will be presented and correlated to well established pathological variations within tissue sections. When analyzing single cells, one generally finds a multitude of slightly or significantly different spectral patterns. Even after eliminating sources of heterogeneity, such as contamination by different cell types, or artifacts due to cellular maturation or cell death, one finds that the spectral patterns vary from one cell to the next. Some researchers have averaged over a small number of cells to derive a "typical" spectrum. There is now evidence that suggests that the residual heterogeneity of the spectra results from different stages of a cell�s reproductive cycle; thus, averaging over a number of cells is likely to destroy this cell phase information Analysis of single cells, on the other hand, opens the possibility to examine a random sample of cells statistically, and ascertain whether or not the proportions of cells in the various stages is perturbed by disease. Such an analysis may employ one of several methods to recognize similar spectra, and cluster spectral patterns into related groups. In addition to the cell�s division phase, single cell spectra contain a wealth of information about the function of the cell or tissue. 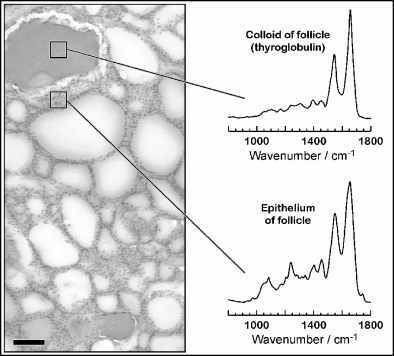 Cells with a large content of membrane bound functionalities exhibit a peak associated with phospholipid membranes. Cells that are actively involved in transcription and replication generally exhibit patterns different from those of inactive and terminally differentiated cells. On the other hand, cells from different organs may appear quite similar or indistinguishable. Thus, it is unlikely that single cell spectra can be used to identify the origin of a cell reliably. Infrared Spectroscopy for the Classification of Cyanobacteria D. McNaughton1, M. Kansiz1, P. Heraud2, F. Burden1, B. Wood1, J. Beardall2 1 Department of Chemistry, Monash University, Clayton, 3168, Australia, 2 Department of Biological Sciences, Monash University, Clayton, 3168, Australia. Cyanobacteria (blue-green algae) comprise a large and diverse group of organisms that are widely distributed in freshwater, marine and terrestrial habitats. Fourier Transform Infrared (FTIR) spectroscopy offers a novel alternative to the classical methods of cyanobacterial taxonomy which have been in an unsatisfactory state for many years . FTIR spectroscopy has been extensively applied to the identification and characterisation of bacteria  such as Lactobacillus, Staphylococcus, Escherichia, Streptococcus and Enterococcus. These studies have shown that the technique has the ability to provide excellent discrimination between different bacterial taxa down to the strain level. Five cultures of various species and strains within four genera were grown in triplicate in a chemically defined media under photoautotrophic conditions. Samples were collected at various times during the exponential and early stationary phase to ensure the collection of viable, actively growing healthy cells. Cell counts were performed on the culture solutions to determine the appropriate volumes for collection. Spectra (648 with 162 to 108 spectra from each of the five taxa) from late exponential to early stationary phase cultures were collected on a Bruker IFS-55 FTIR spectrometer coupled to a Bruker infrared microscope. All spectra were baseline corrected and normalised to the amide I band. Two different chemometrics techniques based on Principal Component Analysis (PCA) were used to classify the samples into their correct classes. These were Soft Independent Modelling by Class Analogy (SIMCA) and K-Nearest Neighbours (KNN). Spectra were divided into four different spectral windows. Classification was attempted using different spectral regions and combinations of spectral regions using the recorded spectra and first and second derivative spectra. The best rate of correct classification of 99-100% was achieved using the SIMCA classification technique in the 1800-950 cm-1 region with first derivative spectra. The KNN's best rate of 98% was achieved in the 1480-950 cm-1 region with first derivative spectra. The use of underivatised and second derivative spectra resulted in slightly lower rates of correct classification with rates. A dendogram was constructed after PCA transformation of the six averaged spectra with two eukaryotic species also included as a comparison. The dendogram successfully distinguished all the samples with the two eukaryotic species far from the cyanobacteria. Kruger GHJ, Helene De Wet, Kock JLF and Pieterse AJH. (1995) Hydrobiologica 308, 145-151. Naumann D, Helm D, Labischinski H. (1991) Nature 351 (6321), 81-82. Quantification of Microorganisms in Mixed Cultures with FTIR Spectroscopy Helene Oberreuter1, Frank Mertens2, Herbert Seiler1 and Siegfried Scherer1 1Institut für Mikrobiologie, FML Weihenstephan, Technical University of Munich, Vöttinger Str. 45, 85350 Freising, Germany 2Bruker Optik GmbH, Wikingerstr. 13, 76189 Karlsruhe, Germany. FTIR spectroscopy has successfully been established as a tool for reliably, quickly and easily identifying food-borne yeasts under routine laboratory conditions . Here we present a new method to distinguish between different species of microorganisms present in a mixed culture with FTIR spectroscopy. Since peak heights of FTIR absorbance spectra only partly correlate with a sample�s cell concentration, it is not possible to give the absolute cell concentrations of a mixed culture of several components. However, the ratio can be obtained. To investigate this method, two systems with mixtures of lactic acid bacteria (Streptococcus salivarius ssp. thermophilus / Lactobacillus acidophilus) and food-borne yeasts (Saccharomyces cerevisiae / Hanseniaspora uvarum) were examined. Type strains were used in all cases. In order to accomplish differentiation between the two different microorganisms, a calibration model using a Partial Least Square (PLS) regression of spectrocopic data and the corresponding concentration values of several calibration data sets was constructed first. This calibration model of a multicomponent system corresponds to fitting a standard curve in a single component system. 24 h. Cells were suspended in distilled water followed by an adjustment of the optical density to obtain the same cell number concentrations in both components of the same system. Both suspensions were then mixed in different cell number ratios and the mixtures transferred onto the sample holder where they were dried and used for FTIR measurement. 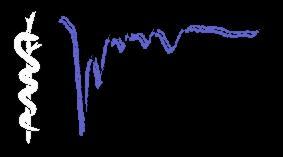 The resulting spectra of the mixtures comprised one calibration data set. Employing the OPUS/QUANT-2 software (BRUKER, Karlsruhe), calibration models were constructed. The appropriate frequency domains (with weights 1.0) for the yeast system were 4000-2800/cm and 1800-600/cm while with the bacteria, the smaller frequency ranges of 1783-1741/cm and 1242-1206/cm were used. By applying a calibration model, it is possible to determine the unknown cell number ratio of a sample when the same microorganisms are present that were used for setting up the model. External model validation with several test data sets yielded different results: Accuracy in the lactic acid bacteria system was very poor, giving a predicted ratio of both microorganisms with an error of ± 13 percentage points. However, the accuracy of prediction in the yeast 2-component system had an error of only ± 5 percentage points. In all calibration models established, the optimal number of factors (the rank) was 7. It is concluded that FTIR spectra of microorganisms can be used to set up a calibration model for a 2-component system of defined microorganisms. This model can be applied to the quantitative determination of the ratio of these microorganisms in mixed culture. Although the specifity of these models was found to be somewhat limited, this technique might nevertheless be applicable to certain quantification problems (e.g. in fermentation processes), provided that the appropriate conditions are kept. Kümmerle, M., Scherer, S. and Seiler, H.: Rapid and Reliable Identification of Food-Borne Yeasts by Fourier-Transform Infrared Spectroscopy. Appl. Environ. Microbiol., 64, 2207-2214, 1998. Confocal Raman Microspectroscopy of Micro-organisms Directly on Solid Culture Media K. Maquelin1, L.-P. Choo-Smith1, H.Ph. Endtz2, H.A. Bruining1, G.J. Puppels1 1Laboratory for Intensive Care Research and Optical Spectroscopy, Erasmus University Rotterdam & University Hospital Rotterdam ("Dijkzigt"), Dept. General Surgery 10M, Dr. Molewaterplein 40, 3015 GD Rotterdam, The Netherlands, Tel. ++ 31 10/ 4635890 or 4633795, e-mail: Puppels@HLKD.AZR.NL 2 Inst. Medical Microbiology and Infectious Diseases, University Hospital Rotterdam ("Dijkzigt"), Dr. Molewaterplein 40, 3015 GD Rotterdam, The Netherlands. Using confocal Raman microspectroscopy, spectra can rapidly be obtained from small sample volumes. With this set-up it is possible to perform measurements of microbial colonies directly on solid culture media. Measurements of microcolonies (cultured for 6 hours) with an average diameter of 30-40 mm yield reasonable signal-to-noise ratios within a few minutes. A problem with this kind of measurement is the presence of a background signal contribution of varying intensity of the culture medium in the measured spectrum. Several methods were investigated for correction of this background signal. One method involved the use of a marker peak in the medium spectrum for estimating the amount of medium to be subtracted. Another approach was to overlay the culture medium with a synthetic filter to block out any medium signal contribution, while still allowing normal growth of micro-organisms. The last approach involved modeling of the medium signal in a principal component space and a vector space. For long term identification and characterization purposes, such as when using a reference database of spectra, constant molecular composition of the media is necessary. Synthetic culture media are more expensive but are advantageous due to constant composition. The high clinical interest in vancomycin resistance of Enterococci prompted this Raman study. Data obtained from a set of 20 E.faecium strains, were used to evaluate the usefulness of microcolonies in discriminating between vancomycin sensitive and resistant strains. Spectra of sensitive and resistant strains closely resembled one another. Therefore chemometric tools such as principal component analysis, linear discriminant analysis and genetic algorithms were employed for discrimination based on drug susceptibility. Preliminary results suggest subtle differences between the two groups and further research is necessary to determine the relevance of these differences. Tissue Diagnostics by Use of Fiberoptic FTIR-Spectroscopy U.Bindig1, W.Wäsche2, H.Winter1, P.Frege3, U.M.Gross3 and G.Müller1,4 1Laser- und Medizin-Technologie GmbH, Krahmerstr. 6-10, 12207 Berlin, Germany 2Univ.-Hosp. Charité, Humboldt Universität Berlin, Schumannstr. 20-21, 10098 Berlin, Germany 3Univ.-Hosp. Benjamin Franklin, Dept. of Pathology, Freie Universität Berlin, Hindenburgdam 30, 12200 Berlin, Germany 4Univ.-Hosp. Benjamin Franklin, Dept. of Med./Tech. Physics and Laser Medicine, Freie Universität Berlin, Krahmerstr. 6-10, 12207 Berlin, Germany. The infrared spectrum of biological tissue is due to the microheterogenous composition as a whole and is based on complex vibrational modes. In detail, the spectrum represents the biochemical status resulting from a combination of the structural framework of the tissue with biologically active compounds of metabolism. As has already been mentioned in the literature, the main IR-spectroscopic differences are to be expected in the characteristic spectral pattern in the �fingerprint� region (1500 - 1000 cm-1). FTIR-measurements using a fiberoptic device were performed, in order to design and develop an endoscopic system for the in vivo identification of healthy and malignant tissue. The source of the IR-radiation was either a FTIR-spectrometer or tunable IR-diode lasers. The fiberoptic based IR-spectra in attenuated total reflectance (ATR) and reflection mode were compared to spectra of the FTIR-microspectroscopic measurement. Biomolecular Interactions Studied by FT-IR-ATR Spectroscopy Matthias Boese & Karim Fahmy* Bruker Optik GmbH, Wikingerstr. 13, 76189 Karlsruhe; Germany; *Institut für Biophysik und Strahlenbiologie, Albert-Ludwigs-Universität Freiburg, Albertstr. 23; 79104 Freiburg, Germany. FTIR-spectroscopy in combination with the ATR-technique allows the monitoring of binding reactions between molecules over a large range of molecular masses. In this study an extension to this method is described in which the ligand can be added to immobilized molecules by dialysis; thereby, preventing mechanical perturbations at the ATR-crystal surface often encountered with flow injection methods. To demonstrate the broad field of applications the association of a heterotrimeric G-protein with its membrane-bound receptor was observed as well as the drug induced dissociation of a receptor-G-protein complex. For this purpose, the low molecular weight compounds were dialysed into and out of the sample compartment according to the membrane's MW cut-off, without diluting preassembled molecular complexes. To increase the delivery of ligands to immobilized molecules on the ATR-crystal to above thermal diffusion rates electrophoretic currents were employed. Using an electric field charged ligands could be specifically transported into and out the sample compartment across the diffusional barrier imposed by the dialysis membrane. Likewise, liberation of proteins from affinity column gels into the aqueous phase could be monitored as a function of the specific diffusible eluting agents. In this case, no immobilization was required, provided the amount of liberated protein is high enough to enable their infrared detection in solution. Employment of a dialysis membrane is crucial for this application in order to avoid non-specific losses of protein, which would occur upon conventional wash procedures. In summary, a method was developed allowing to sensitize and accelerate the study of protein-ligand interactions by FT-IR-ATR-spectroscopy. Bioprocess Monitoring by Infrared Spectroscopy of Bacterial Cells K.C. Schuster(1) , F. Mertens (2) , M. Grube (3) , and J.R. Gapes (1) (1) Inst. of Chem. Engineering, Fuel and Environmental Technology, Vienna Univ. of Technology, Getreidemarkt 9/159, 1060 Wien (Vienna), Austria. Tel: (+43)(1)58801-5063, Fax:(+43)(1)587 63 94, e-mail: kcs@fbch.tuwien.ac.at (2) Bruker Optik GmbH, Wikingerstr. 13, D-76189 Karlsruhe, Germany (3) Inst. of Microbiology and Biotechnology, Univ. of Latvia, Kronvalda blv. 4, 1586 Riga, Latvia. Biotechnological processes often use living microorganisms as a biocatalyst to transform organic substrates into higher value products. In many bioprocesses, a set of alternative metabolic pathways can take place, leading to different products. The condition of the microorganism, its "physiological status" which governs these pathways, is often difficult to control or even to assess, except in the final result, the formed products. Here we describe a novel approach to monitor this physiological status of a microbial culture. The process example is the acetone- butanol - (ABE-) fermentation by Clostridum strains for producing organic solvents (1-butanol and acetone) from sugar substrates or organic waste materials. However, an alternative pathway in the organism, necessarily taking place during growth of a culture, leads to unwanted butyric and acetic acids. It is possible to perform the two pathways consecutively in batch cultures, as was done at industrial scale. By empirical procedures it has been achieved to balance the simultaneous pathways in continuous cultures [1, 2]. There have been various approaches to characterise the physiological status of Clostridium cultures [3 -5]. We obtained FT-IR spectra of bacterial cells from several time points of the ABE process in the mid-IR range. The spectroscopic method which we used has been developed for identification of microorganisms, comparing different strains and species . We applied it to a single organism at various stages in the development of a culture, and correlated the similarities of the spectra with process parameters and other markers for the physiological status of the cells. Additionally, the interpretation of some distinct spectral bands allow a semiquantitative assessment of the overall biochemical composition, as the content of proteins, carbohydrates, lipids, and nucleic acids . A complementary experiment is to record conventional IR spectra and do a quantitative evaluation according to the method of Zagreba et al. (1990) . A considerable number of topical narrow absorption bands in IR-spectra of organic substances permit not only to identify pure compounds, but also to perform a qualitative and quantitative analysis of complex multi-component mixtures - such as microbial biomass. A system of Vierordt equations for carbohydrates, nucleic acids, proteins and lipids is applied for quantitative evaluation of spectra. This method allows to follow the biochemical changes in biomass during the fermentation process by analysing the main cell components simultaneously. Literature Cited  Qureshi, N. & I. Maddox (1988) Bioprocess Engineering 3:69pp. Gapes, J. et al. (1996) Appl. Environ. Microbiol. 62:3210pp. Jones, D. T. et al. (1982) Appl. Environ. Microbiol. 43:1434pp. Andersch, W. et al. (1983) Eur. J. Appl. Microbiol. Biotechnol. 18:327pp. Schuster, K. C. et al. (1998a) Appl. Microbiol. Biotechnol. 49:669pp. Helm, D. et al. (1991) J. Gen. Microbiol. 137:69pp. Schuster, K.C. et al. (1998b) Vibrational Spectroscopy, in press. Zagreba, J. et al. (1990) In: Microbial Conversion, Riga, "Zinate", 139pp. Biopolymer Accumulation Control in Microbial Cells by IR-Spectroscopy M.Grube, E.Zagreba, G.Bonartseva * University of Latvia, Institute of Microbiology & Biotechnology Kronvalda blv. 4, 1586 Riga, Latvia * A.N.Bach Institute of Biochemistry, Russian Academy of Sciences Leninsky prospect. 33, 117071 Moscow, Russia. IR-spectrophotometric analysis of whole microbial cells is especially productive when investigating the accumulation processes of reserve substances: polysaccharides, lipids and poly-ß-hydrohybutyric acid (PHB). Under certain conditions microbial cells accumulate these compounds in large amounts that determines the biomass quality. IR-spectral analysis allows to control simultaneously and without any chemical treatment all cytochemical compounds present in microbial biomass. High selectivity and informativity of IR-spectroscopy, simplicity of analysis and the small amount of substances under investigation stimulate the adoption of the method in investigations of complex biological objects. The additive character of absorption spectra and the presence of typical absorption bands of major biochemical components in IR-spectra of whole cells permit to quantitate these compounds in the composition of a microbial biomass. Spectrophotometric methods of determining the concentrations are based on the law of Beer, which works if the relation between the optical density and concentration is expressed by a straight line passing through the origin of coordinates. On the basis of the law of Beer for multicomponent mixtures and determined extinction coefficients, a system of Vierordt equations for carbohydrates, nucleic acds, proteins, lipids has been created and quantitative analysis of microbial biomass carried out. Changes in the chemical composition of Actinomycete biomass in the dynamics of the bath culture development were established in a number of specific experiments. Carbohydrate concent - 25%d.w. was reached after 72 hours and decreased to 10% d.w. at 168 hour of cultivating. Protein concentration was 58% d.w. after 48 hours cultivation and decreased up to 35% d.w. at 168 hour. During cultivation cycle lipid content increased from 1.5% to 34% d.w. Under conditions of a limited or inhibited culture growth, especially by nitrogen sources, reserve biopolymers may accumulate in microbial biomass in great quantities, manifesting themselves in IR-spectra of whole microbial cells by typical absorption bands. The effect of various carbon sources - sucrose, glucose, mannite - on the chemical composition of the biomass of pea nodule bacteria (strain 245) was investigated. Content of poly-b-hydrohybutyric acid varied from 2% d.w. to 60% d.w. Regulation of the PHB formation process by microorganisms belonging to different taxonomic groups as Eubacteria, Cyanobacteria, Rhizobiums, Azotobacters was studied. Some strains of Azotobacter sp. capable to accumulate PHB up to 90% d.w. have been selected. Intelligent Systems for the Quantification of Biotechnological Systems from Hyperspectral Data Douglas B. Kell*, Michael, K. Winson, Aoife C. McGovern, Naheed Kaderbhai, Adrian D. Shaw and Royston Goodacre. Institute of Biological Sciences, University of Wales, Aberystwyth, Ceredigion, SY23 3DD, Wales. *Telephone: +44 (0)1970 622334; Telefax: +44 (0)1970 622354; E-mail: dbk@aber.ac.uk. Of approaches to finding new pharmaceuticals, the development of rapid and efficient methods for the screening of large numbers of microbial cultures for the production of biologically active metabolites retains preeminence . Such metabolites can additionally provide new structural templates for synthetic programmes using rational methods of drug design through chemical synthesis, including combinatorial methods . It is imperative therefore that the concentration of the fermentation product (the determinand) is assessed accurately, both so that the most high-yielding strains are selected, and to assist the subsequent optimization of the bioprocess. The development of such monitoring methods is driven by economic and ecological needs, and more recently by the requirements for better process documentation [3, 4]. The whole-organism fingerprinting methods of pyrolysis mass spectrometry, diffuse reflectance-absorbance Fourier transform infrared spectroscopy, and Raman microscopy can be used for the prediction of the chemical properties of microbes and their activities, particularly with regard to the quantitative detection of high-yielding strains. The implementation of artificial neural networks, which peform supervised learning, to the analysis and deconvolution of these hyperspectra is essential and are much more powerful than unsupervised chemometric methods. Examples will include: (1) the development of our DRASTIC  approach for the detection of the over-production of aristeromycin and neplanocin A in Streptomyces citricolor , (2) the quantification of the expression of the heterologous protein a2-interferon in Escherichia coli , (3) the monitoring of the plant growth hormone giberellic acid in fermentor broths using FT-IR and dispersive Raman spectroscopy, and (4) the non-invasive, on-line monitoring of the glucose to ethanol biotransformation by the brewing yeast Saccharomyces cerevisiae using Raman microscopy . Bevan, P., Ryder, H. and Shaw, A. (1995) Identifying small-molecule lead compounds - the screening approach to drug discovery. Trends in Biotechnology 13, 115-121. Gordon, E.M., Gallop, M.H., Campbell, D., Holmes, C., Bermak, J., Look, G., Murphy, M., Needels, M., Jacobs, J., Sugarman, J., Chinn, J. and Fritsch, B.R. (1995) Combinatorial organic-synthesis - applications to drug discovery. European Journal of Medical Chemisty 30 No.SS, S 337-S 348. Scheper, T.-H. and Lammers, F. (1994) Fermentation monitoring and process control. Current Opinion in Biotechnology 5,187-191. Kell, D. B. and Sonnleitner, B. (1995). GMP - Good Modelling Practice: an essential component of good manufacturing practice. Trends in Biotechnology 13, 481-492. Winson, M. K., Goodacre, R., Woodward, A. M., Timmins, É. M., Jones, A., Alsberg, B. K., Rowland, J. J. and Kell, D. B. (1997). Diffuse reflectance absorbance spectroscopy taking in chemometrics (DRASTIC). A hyperspectral FT-IR-based approach to rapid screening for metabolite overproduction. Analytica Chimica Acta 348, 273-282. Winson, M. K., Todd, M., Rudd, B. A. M., Jones, A., Alsberg, B. K., Woodward, A. M., Goodacre, R., Rowland, J. J. and Kell, D. B. (1998). A DRASTIC (Diffuse Reflectance Absorbance Spectroscopy Taking in Chemometrics) approach for the rapid analysis of microbial fermentation products: quantification of aristeromycin and neplanocin A in Streptomyces citricolor broths. In New Frontiers in Screening for Microbial Biocatalysts, pp. 185-191. Edited by K. Kieslich, C. P. van der Beek, J. A. M. de Bont and W. J. J. van den Tweel. Amsterdam: Elsevier. McGovern, A.C., Ernill, R., Kara, B.V., Kell, D.B. & Goodacre, R. Rapid analysis of the expression of heterologous proteins in Escherichia coli using pyrolysis mass spectrometry and Fourier transform infrared spectroscopy with chemometrics: application to a2-interferon production. Journal of Biotechnology, submitted. Shaw, A.D., Kaderbhai, N., Jones, A., Woodward, A.M., Goodacre, R., Rowland, J.J. & Kell, D.B. Non-invasive, on-line monitoring of the biotransformation by yeast of glucose to ethanol using dispersive Raman spectroscopy and chemometrics. Biotechnology and Bioengineering, submitted.